The East End is the cradle of Jewish life in England. At the beginning of the 20th century, it was said there were as many Jews living in one square mile of the East End of London as there are throughout Britain today – over 250,000 people. Today, estimates say, about 2,000 Jewish people live in the East End. Many of them are elderly, and there are just three synagogues still functioning in the East End. 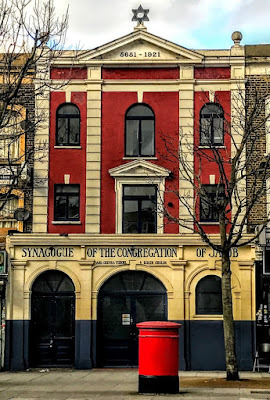 After my reflections early this week in the Royal Foundation of Saint Katharine on Dan Jones’s painting of Jewish figures in the East End, I decided to visit one of these three still-functioning synagogues in Stepney. Sam Melmick has mapped over 150 synagogues in the area, as well as a multitude of shtiebls serving the Jewish community in the East End. 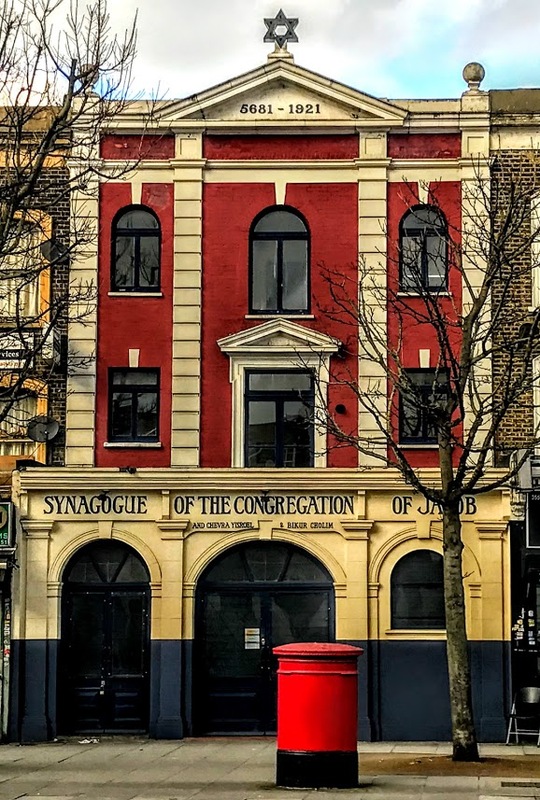 Today, only three remaining synagogues are still in use: Sandy’s Row, East London Central, also known as Nelson Street, Fieldgate Street Great Synagogue and the Congregation of Jacob, or Kehillas Ya’akov. Although the date above is ‘5681 – 1921’, this community has been present in the area for over a century. It was founded in 1903, but incorporates three smaller, earlier synagogues – Chevra Yisroel, Bikur Cholim and Steziver Synagogue. This is one of the last three synagogues still functioning in the East End and was the first Mizrachi Synagogue in Britain, founded in 1903 by Morris Koenigsberg and Abraham Schwalbe. The early congregation was made up of first generation immigrants from Poland, Lithuania and Russia, and they were Orthodox Jews from small shtetls such as Stetziver, Kalisz and Vikaviskis. They met in the front room of Morris Koenigsburg’s family house on Commercial Road, and Abraham Schwalbe lived a few doors away. 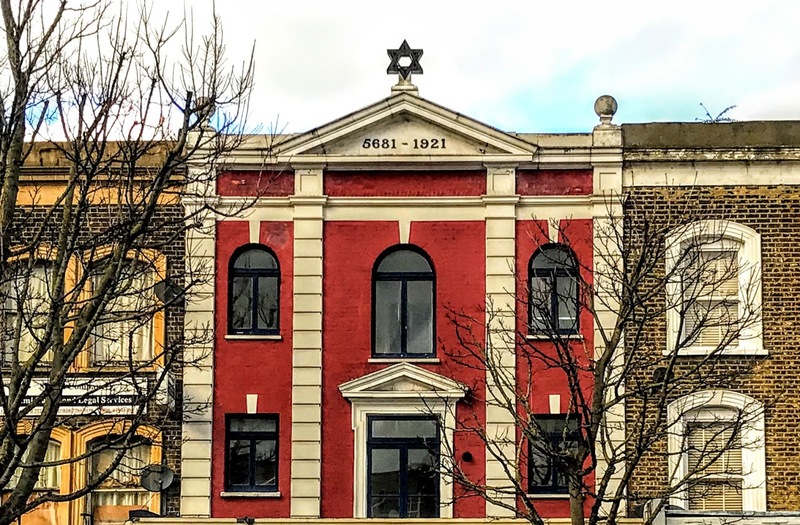 This shul or synagogue originally was a constituent member of the Federation of Synagogues, founded by the philanthropist Samuel Montague MP in 1887 to improve the conditions for worship of the numerous small and often ill-ventilated chevras or prayer groups in the East End. The federation offered loans to rebuild and convert many synagogues. But it often insisted that smaller chevras merged into larger congregations. Because of this, Kehillas Ya’akov absorbed the maller Chevra Yisroel (Society of Israel), the Bikur Cholim (Visitors of the Sick) and the Stetziver Synagogue. The synagogue moved to 351-353 Commercial Road, which had been a bootmaker’s shop before World War I. The new synagogue was designed by Lewis Solomon and Son, honorary architects to the Federation of Synagogues, and was reconsecrated in 1921. Kehillas Ya’akov was the first Mizrachi Synagogue in Britain, and to this day the congregation remains Modern Orthodox. Most members still live locally, although the character of the congregation is more cosmopolitan than it once was. The service is still Ashkenazic in style, but the Sephardic influence can be felt in the soft pronunciation of the Hebrew. The synagogue is independent and is owned, managed and maintained by members of the community. The women’s gallery that fills three sides is out of use and needs the repair work to stabilise it. Instead, the women now sit behind the men at the back of the shul, behind a mechitzah or curtain partition. In summer, light floods through the glass roof, a feature imported from Eastern Europe and a feature common in the shuls of the East End as one of the only ways to bring natural light into buildings in the middle of a terraced row. The Revd David Brandes leads the congregation and is also the warden of the shul. He has a long-standing family connection with the shul: his maternal grandparents lived on Lucas Street, now Lukin Street, where the Bikur Cholim was located. While he was walking past the synagogue one day about 20 years ago, he saw swastikas scrawled in graffiti on the outside wall, and began to take an interest in its life and its future. At the time, the synagogue was run by two brothers, Morry and Ixxy Lixenberg. Even when they were ill, the Lixenberg brothers did all they could to ensure that the shul remained open. A direct descendant of one of the founders, Dr Monty Passes – a grandson of Abraham Schwalbe – is now in his 80s and is a member of the congregation. Kehillas Ya’akov describes itself as a community where everyone is valued and where everyone has a vital role to play and contribution to make. The Chief Rabbi, Sir Jonathan Sacks, spoke at the centenary service for the synagogue in June 2003. He recalled that most of his early childhood was spent in Commercial Road. Kehillas Ya’akov is ‘a valuable and venerable relic of Anglo-Jewish history’ and ‘one of England’s last intimate folk-art Eastern European synagogues.’ The presence of this living synagogue on Commercial Road is a reminder of the past and a reminder of the world of East End Jewry that the Jewish community is leaving behind. The congregation today is welcoming and diverse, with members from all types of trades and backgrounds. They proudly retain their independence, and the synagogue is owned and managed by members of the community. There are still times when the minyan or quorum is weak, particularly in the winter when it is more difficult for our older members to attend. But somehow, they always manage to find a tenth man on a Saturday morning. There are some indications that many young Jews are returning to their roots, and in the East End the wider community recognises the need to preserve a fast disappearing heritage. 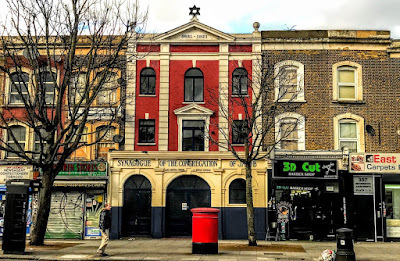 The real fear is that this may be too late to ensure that the remaining East End synagogues not only survive but prosper in the generations that follow.